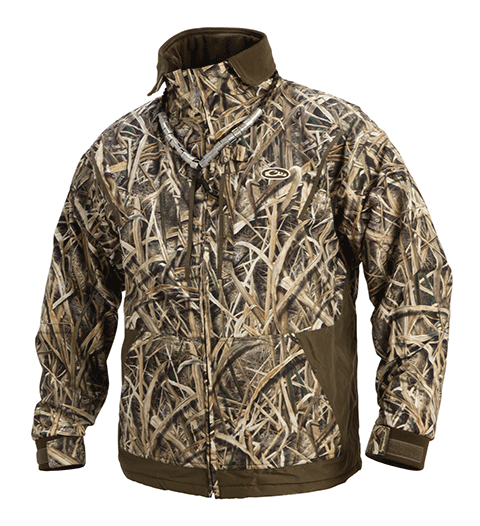 A trim, comfortable alternative to a heavy outer coat when the weather turns cool, the MST Waterfowl Fleece-Lined Full Zip 2.0 is made from Refuge HS™ fabric with 100% waterproof/windproof/breathable HyperShield Technology™. The performance of this jacket is maximized by Instinctive Features like the Deep Water™ handwarmer pockets, Magnattach™ call pocket, zippered chest pocket, and adjustable neoprene cuffs. For increased durability, we added reinforced material in high-wear areas such as the lower waist, lower back, underarms, and pocket openings. 100% Waterproof/Windproof, Breathable Refuge HS with Hypershield 2.0 technology, fleece lining, taped seams, adjustable neoprene cuffs, reinforced wear areas with laminated 300 Denier fabric.